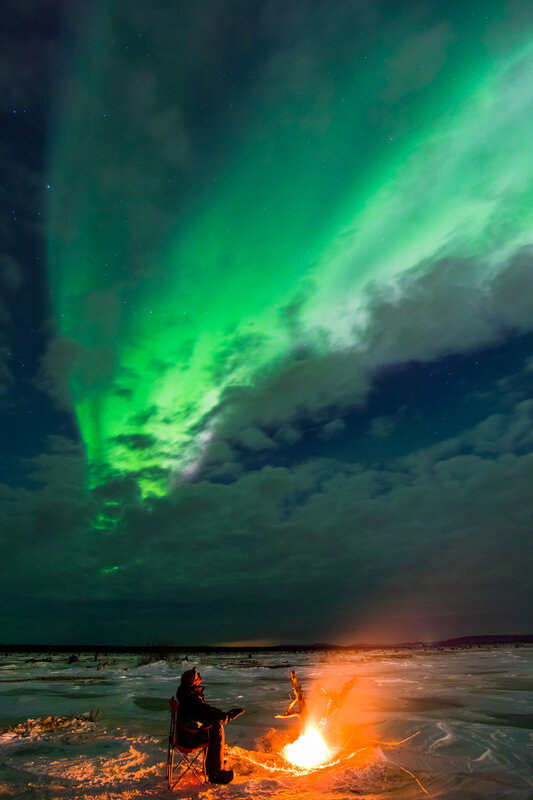 A selection of photos of the aurora borealis. I'm always on the lookout for interesting foreground to balance these incredible displays that fill the Alaska night sky. Aurora photography requires a mix of creativity and problem-solving to conceive, plan, and execute unique shots, as well as the willingness to brave the darkness, snow, and subzero cold of the Alaskan winter. For tips on shooting creative aurora images, see my Aurora Photography Guide. I also provide Aurora Photography Tours & Workshops. 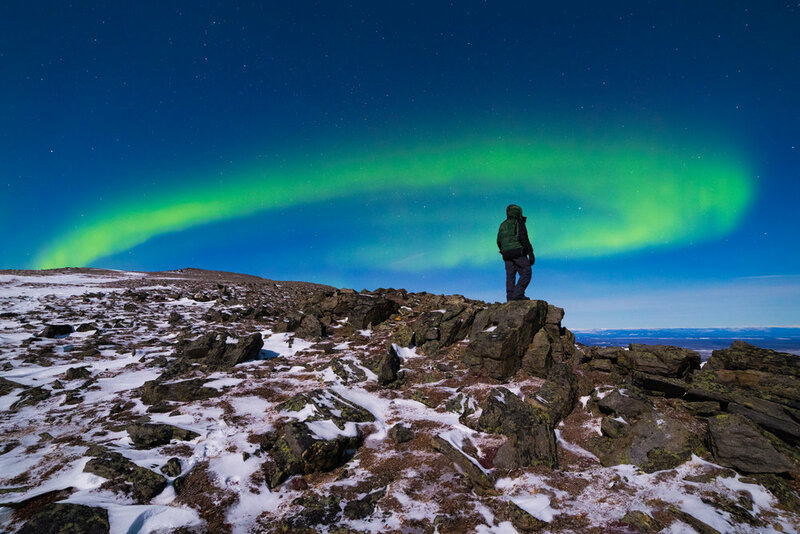 Watching the aurora next to Devils Thumb in the eastern Alaska Range. Lighting up the alpine foreground of Donnelly Dome with a makeshift torch beneath the aurora. Spawning silver salmon in Clearwater Lake beneath the aurora. Aurora borealis reflects in the Clearwater River in Delta Junction. Staying toasty next to a fire while watching the aurora from the Jarvis Creek gravel bar in Delta Junction. A colorful aurora burst above Donnelly Dome. The crescent moon sets above the horizon beneath a vivid aurora display. Dramatic aurora display above silhouetted trees. On top of Donnelly Dome on a -20 F night. Colorful aurora borealis over Granite Mountain. 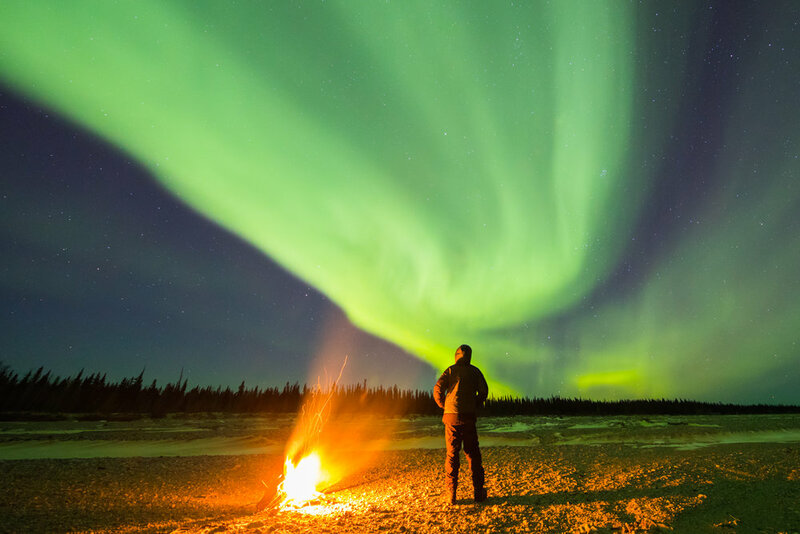 Staying warm next to a campfire on the Delta River beneath the aurora borealis. The aurora swirls above mountains in Denali National Park. Aurora borealis and the rising moon reflect in the Clearwater River. The aurora goes wild during a geomagnetic storm above the Gerstle River bridge on the Alaska Highway. Tending a campfire beside a frozen pond while the aurora shimmers through thin clouds.